Corporate PropTech Accelerators? Why not? A ploy to attract attention? A few days ago, I read and article in a Spanish digital newspaper where the CEO of a startup complained and showed her unease about the acceleration programs sponsored by corporates. She thinks that these programs look for a marketing impact more than try to innovate or figure out company’s problems through the solutions that startups can provide. Sometimes startups lose their time in processes like these. Well, I understand this complaint because sometimes not even corporations know exactly which problems startups or technology are able to solve. We cannot forget that, until recent years, real estate companies approach to technology have not gone beyond IT systems (at least in Spain). It is true that the appeal of these accelerator programs could be the monetary prize but there are other intangibles that should not be scorned like the access to mentors or the chance to solve real problems from a corporate and work shoulder to shoulder with them. Talking in general, accelerator programs help startups to develop their initial idea, establish the business model, design and prove the scalability, identify who are their potential customer and how to raise capital and hire people. All in a short time. As well as all that, I mentioned startups inside an accelerator program, get mentoring, intensive teaching and funding. A new type of accelerator - corporate companies that launch challenge focused competitions based on business problems in order to attract startups. These business accelerators have the capability to know where business opportunities are, find the market niches where technology could be disruptive, etc. In general, they have a nose for knowing where there is a way to create or innovate a market. Of course, they do not guarantee the success because there is not only one way to get it and market always could change or kill you, but they know how to prove your business model in a short period of time. During the last years, this concept is flooding traditional corporations in all markets (tourism, finance, health, travel, mobility, energy and, few years ago, real estate among others). Different companies with different sizes have started to adopt acceleration models to run or keep innovation inside their business model and to continue being competitiveness. This model allows them to reach innovation in agile and fast way in a changeable market. There are many reasons for companies to launch their accelerator programs such us talent recruitment or detecting new business opportunities. These goals, sometimes, are faster to reach with accelerator programs instead internal innovation. Usually these programs are set up between corporations and accelerator companies joined, creating in that way a successful partnership: traditional business and their problems on one hand and fast grow and innovation on the other. Talking about Spain, there has been a rise about creation and launch of acceleration programs and corporations have been the key for that. According to El Referente (the most important startups magazine in Spain) from 2016 to 2018 there have been over 40 acceleration programs launched. Out of 156 acceleration programs detected in 2018, 25% are innovation and acceleration initiatives linked to incumbent corporations. This is a huge number if we think that big companies did not have presence in the sector five years ago. But it was in 2018 when acceleration programs rocketed. run their accelerator o acceleration programs internally managed or by third parties. Most of them focus on their business lines. Neinor Next promoted by Neinor Homes (one of the main real estate residential developers) and powered by Barrabes.biz with the goal to push digital transformation in real estate through the support and collaboration with startups capable to provide innovation to sector. In a first phase there were 500 global startups and in the final phase Neinor work with 4 of them: Architectures, Bigle Legal, Plachtherm and 4Domo. The latest to the game is Merlin Properties, the largest Spanish real estate company which Iisted in Spanish stock market. They have join to Impact Accelerator (the accelerator business of ISDI, the most important business school specialized on digital business) to create Merlin Proptech Challenge which I have the pleasure to collaborate with. Merlin Properties has a portfolio formed by Offices, Shopping Centers, High Street Retail units, Logistics, Hotels and lands located in Spain and Portugal and valued about 7,5 thousand M €. Nine startups will be selected for this month-long premium acceleration program, which includes business training, custom mentoring, pitching at the MERLIN Demo Day, and the chance to collaborate on pilot programs and proofs of concept. Additionally, three startups will receive €10,000 and the top three will receive €20,000 equity free. 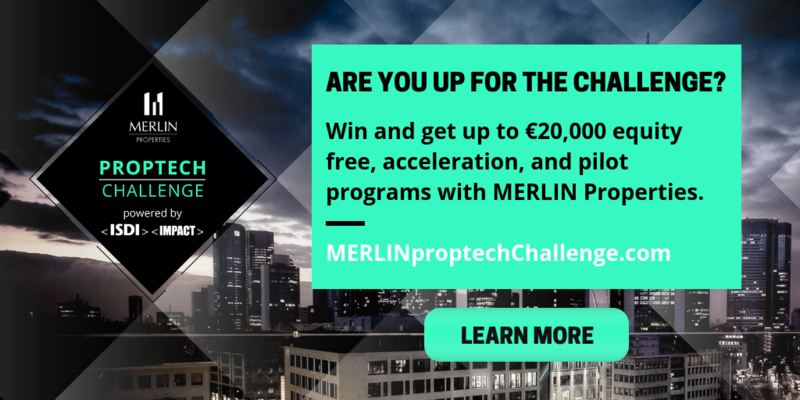 MERLIN Properties PropTech Challenge is focused on improving customer experience, increasing efficiency, bettering logistics and mobility and more in three key areas: shopping malls, offices, and logistics. The deadline to apply is 30th January. Why should you apply to this program or other corporate accelerator programs? It’s true that is a new concept for real estate companies because innovation, in general terms, has gone off recently and they need to trainee on it. But no matters because they usually join teams, like Impact Accelerator in this case, that manage, address and mentoring all the process and they have startups expertise. On the other hand, collaborating with real estate companies in an environment like this, you can live the experience to know pain points of the real estate companies directly and you have the chance to solve them and know theirs teams. This collaboration will be useful to deal with other real estate companies and will help you to get new customers if you have a B2B business. Of course, you will need patience because real estate corporations are taking their first steps in innovation and they have a lack of empathy with startup problems and the necessity to scale fast. Definitely, join a corporate accelerator program will be beneficial for both parties (startups and corportations) beyond that getting equity. 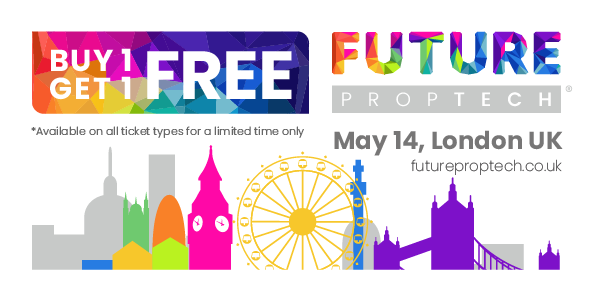 FUTURE PropTech on May 14th in our International Zone!